Pramodaji Chitrabhanu is a fine human and a devout Jain, in that order, because to be a truly good human is to be a true Jain. 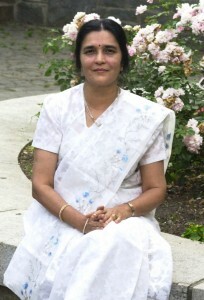 She is an acclaimed Jain scholar and is gifted with refined and chaste upbringing, quality education, and high intelligence, perceptive and insightful mind and, above all, a heart that is perennially flooded with compassion and amity towards all. Pramodaji’s mission takes her to many parts of the world, hence she is rightly called “A Global Personage.” She connects particularly well with the youth because her approach is genuinely secular and multi-cultural. This is the reason why she has scores of admirers all over the world, whose lives have been transformed by her gentle, rational and persuasive guidance. When in the USA, Pramodaji officiates annually at invited Paryushana celebrations, shares lectures in Gujarati, and gives classes in English to Western students, exposing them to the vision, ideals and concepts of Jain Dharma.